The specimens inspected in this benchmark are representative of structures like wing aircraft containing rivet holes and potentially cracks initiating on rivet edge. Therefore, 4 cases are studied and it is proposed to compare results of simulation and experiment based on mono- and multilayers plates inspection by Eddy courant. In every pieces there is a flat bottom hole juxtaposed to a thin notch. 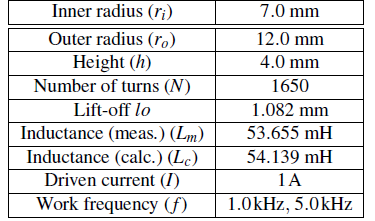 Measurements are carried out at 1kHz and 5kHz for the 4 cases presented in the folllowing pages with a coil operating in double function at which geometrical features are gathered in the table of the figure below.